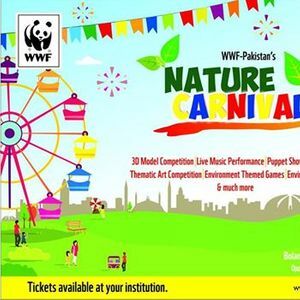 WWF-Pakistan annually invites thousands of students, teachers, professionals and families to its Nature Carnival. This mega awareness raising event encourages students to explore and understand problems and find innovative solutions to the country’s current environmental challenges. This event will engage students and teachers of the private and government schools, colleges and universities in various fun-filled competitions, 3D model making, art competition, games and other activities. Join us in Pakistan’s largest environmental education platform. Showcase your expertise and knowledge for conservation of environmental resources. The aim of the carnival is to highlight the environmental problems and to propose the most effective solutions for addressing the global environmental concerns. Protection of the only planet which sustains life is the ethical and moral responsibility of each one of us, as we're the custodians of it. Students will be participating in the following themes based on their grade. How can Schools / Colleges and Universities Participate? Register for a stall, where you can display your models. 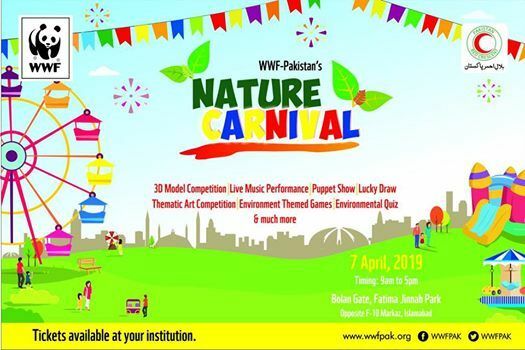 Registration fee is PKR 5000/- per stall. 1. Chance to become part of world's leading environmental conservation organization. 2. Certificate of participation will be awarded to all participating students. 3. 1st, 2nd and 3rd Prize will be awarded to the Best Stalls. How to set up a Corporate/ Food Stall? For Sponsorships, please feel free to contact Mr. Taseer Ali Mirza via email at dGFtaXJ6YSB8IHd3ZiAhIG9yZyAhIHBr or call 0345-5515666.